Story: Nick Pugh was a fireman who liked fire so much he began working as an arsonist for hire under the name Arson . On a job for the crime czar Vendetta he ran into the vigilante ShadowHawk . In the following fight with ShadowHawk, his tank with liquid for his flamethrower exploded  and he found himself on fire . Being on fire all the time became a problem in time. He couldn't touch anything and whatever he ate became burned before he could taste it leaving only the taste of charcoal. He was also unable to walk around anonymously and was isolated from his friends and family. The only contact he had was the other Regulators. The teammate Scandal who had the ability to adapt to his power offered the only physical contact he could have . Arson's current whereabouts are unknown but must be assumed to be with the Regulators still. Skills & abilities: Arson's skin is on fire making him able to burn whatever he touches that is not flameproof. 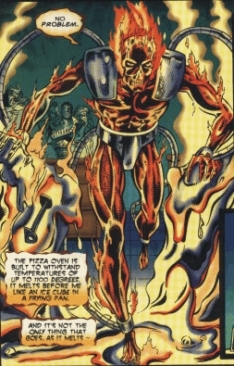 Arson has not pyrokinetic abilities himself but his exoskeleton gives him powers equivalent to having a flamethrower. Equipment: Originally Arson wore a fireproof armor with a flamethrower. Later he wore an exoskeleton, which made him able for focus his powers.